This review is of the cut shown at the BFI London Film Festival in October 2018 – it is currently scheduled to be broadcast on BBC Two later this year. Ben Wheatley has made a career out of films that delight in killing off all sorts of characters in many gruesome ways, regardless of whether or not they deserved it. But now, with his latest film Happy New Year, Colin Burstead., he has achieved the impossible; he’s made a film in which nobody snuffs it. Seriously, the most violent thing that happens in the entire film is that someone trips on a step, and even that happens fairly early on. But once you pay witness to the destructive family dynamic on display here, which is overflowing with awkwardness and clashing personalities, you’ll wish that the one person Wheatley killed off in this film was you. The film focuses on a family party organised by the Colin Burstead of the title (Neil Maskell), who has arranged for the entire Burstead clan to shack up at a large stately manor for the New Year’s celebrations. However, unbeknownst to many of the family members, Colin’s sister Gini (Hayley Squires) has also invited along her brother David (Sam Riley), who five years ago left his wife and children for another woman, and who shows up with his new German squeeze Hannah (Alexandra Maria Lara, Riley’s real-life wife) in tow. While almost nobody, especially Colin, is pleased to see the black sheep of the family turn up unexpectedly, the family rows begin long before he even shows up; there are awkward run-ins with exes, Colin’s boozy father Gordon (Bill Paterson) trying to ask for money to pay off some substantial loans, and most awkward of all there’s the terminally-ill uncle (Charles Dance) who’s begun crossdressing and is drinking everyone under the table. Needless to say, there’s plenty of family drama here to fill an entire season of a daytime soap opera, but it’s all done with Wheatley’s trademark curt and darkly sly sense of humour. It’s extremely slight in comparison to some of his more recent films, least of all because nobody at any point goes out in gory fashion, though there is always that thought at the back of your mind while you’re watching it that something crazy is going to happen. But it never does, and what we’re left with is Wheatley’s version of a very dysfunctional on-screen family just bickering back and forth with each other for ninety straight minutes; it’s an interesting change of pace for the director, but it is also a concept that does become repetitive and dilly-dallying the further on it goes. The choppy editing, which cuts back and forth between various conversations (sometimes even right in the middle of one), can be quite jarring as well as make the film somewhat unfocused. I have to wonder if what I saw was more of a rough cut with the final edited version being made available later on, though given it was deemed completed enough for it to debut on the big screen at the BFI London Film Festival, chances on that being the case are slim. It also does not surprise me that Wheatley is apparently writing a TV series based on these characters, because at times this movie feels like a pilot that was extended to feature length instead of the usual half-hour format; part of me thinks that if this were a series, or if it at least started out that way, then maybe the choppiness and overlaying plots might work a little better, but as a film it leaves a lot to be desired. The movie overall is problematic, from the editing that can never seem to decide which scene it wants to focus on, to the soapy sub-plots that would again fit much better in a half-hour sitcom than a feature, but there are a few positive notes I can give the film. For one, it’s got an excellent ensemble cast; you have thespians like Charles Dance and Bill Paterson on one end, and slightly younger but no less effective talents like Sam Riley and Hayley Squires on the other, all of whom give natural and slightly compelling performances despite some of the thin material many are given to work with. The cast is credited with contributing to Wheatley’s script through improvisational means, and you can tell that this was an improv-heavy shoot just from hearing these actors trading back-and-forths with each other, as again it sounds so natural and on-the-spot every time they speak, which is a large percentage of the movie in case you hadn’t figured that out already. I will also say, as uncomfortable as you may be feeling throughout most of this movie as you’re trapped in the middle of this heated family drama, it does end on a bittersweet note that did actually make me feel a little warm inside. At its core, despite all of the awkwardness, family is a key element in most of our lives, and watching how this movie ended made me really glad that I have my own family to fall back on and welcome with an open embrace like the family in this film eventually do. On the day after this review is published – that being Saturday 13th October 2018, to imprint it for all eternity – my sister is getting married, and right now family unity is more important than it ever has been, which is the one thing that Happy New Year, Colin Burstead., despite its many flaws, manages to achieve perfectly; to remind us all that, no matter how many times we squabble or fight, we are all family, and we need to be there for each other because, like it or not, we only get one, so we mustn’t ever waste that opportunity. 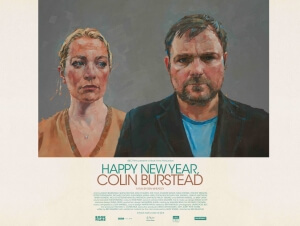 Happy New Year, Colin Burstead. is a flawed entry by Ben Wheatley, with choppy editing and soapy sub-plots that would suit a TV series better than a film, but is saved by a strong ensemble cast and its bittersweet reminder of the importance of family unity – albeit in the most Ben Wheatley way possible.